Welcome to Addiction Charters, where Captain Dave Garnier invites you to treat yourself to a professionally guided Lake Michigan charter fishing trip of a lifetime. Addiction Charters is ideally located at North Point Marina in Winthrop harbor Illinois, just an hour north of Chicago and thirty minutes south of Milwaukee. 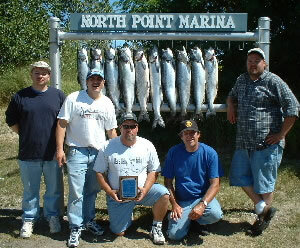 North point Marina is one of the top salmon producing ports is in Illinois, and is closer to deep water, which means more time fishing. Captain Dave Garnier will be your guide to hook you up with tackle testing Kings, aerial bound Rainbows, and cooler filling Coho Salmon of Lake Michigan. When fishing aboard Addiction, a Trojan 10 Meter International with a wide 13' beam, twin 454 engines and a huge back deck, there is plenty of room to land the fish of a lifetime.